Applegate HomeCare & Hospice is looking for full and/or part time CNA. immediate openings. Please call Donna at 801 261 3023. Mountain View Home Health and Hospice is Hiring CNA's, RN's, and a f...ull time Receptionist/ Office Manager! If you you are interested in joining our team apply through our website at MountainViewHH.com. Hearts for Hospice Murray hiring Aide for full time, days eves, week...ends! Apply in person. 142 E 5600 S suite 110!!! Great pay and benefits and excellent clinical team! I am contacting you because our Assisted Living Facility (Canyon Creek Assisted Living) is desperately in need of CNAs at this time. Can I inquire as to how we can get the word out to your students that we are hiring? Our executive director is willing to travel and speak to the classes and let them know that we are hiring, or I could fax a sign or something to you. We are very in need, and ...I think a lot of students would like to know of our openings! We are hiring CNA’s for Daytime, night time, and weekend shifts. Even if a CNA is not certified but is about to be, we would love them to come fill out our application and take the integrity survey. 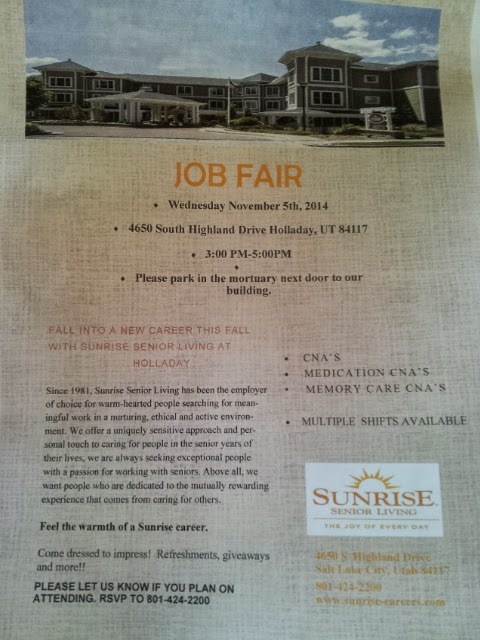 We are hiring for Full Time and Part time shifts in both our Assisted Living, and our Memory Care units. The residents here are VERY fun! If they do choose to apply, they need to come, in person, to 7235 S. Union Park Ave, Cottonwood Heights, UT 84047. And they need to bring an I.D.! Job Duties: Supports nursing staff in maintaining a therapeutic milieu by performing routinely assigned tasks and carrying out patient care activities within the scope of the MHT/CNA training and experience. The MHT/...CNA will maintain a safe and professional standard for patient care according to facility mission, policy and procedure, and in accordance with all external regulatory and credentialing bodies. MHTs/CNAs will assist nurses in transporting patients, checking vitals, and routine safety checks. CNA applicants must be able to lift, carry, bathe, and assist geriatric patients with hygiene needs. CNAs will work with geriatric, psychiatric, and chemical dependency patients. Job Requirements: High School diploma or GED mandatory. Certificate of attendance at approved nursing assistant technician program preferred. Must be able to stand on feet for long intervals and have dexterity to participate in physical restraint of patients when necessary. A certain amount of walking and standing are often necessary to carry out job duties. Lifting/carrying will routinely exceed 10 pounds and involves assisting patients in ambulation, positioning and ADL's. CNAs may be required to lift, roll, or otherwise assist in moving patients. May be subject to physical confrontation and possible assault behaviors from patients.